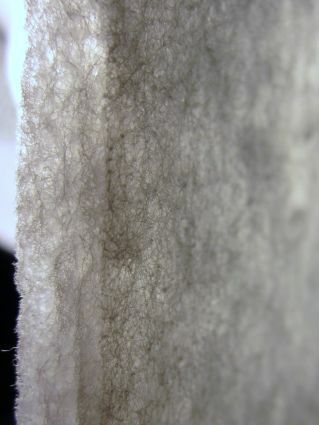 Aerogel is a material that has been around for over 75 years, but it has just recently been used in some very futuristic building applications as thermal insulation. It is a traditionally a silica based material that is comprised mostly of air…90% or more! Starting out as a gel, the liquid element is extracted during production, leaving air pockets behind. Cabot Corporation has taken this technology and made it commercially available in the form of insulating white blanket-like sheets. About 2” of the material has an approximate insulating value of R-12. Now, instead of eliminating the translucency of outdoor materials in exchange for insulation, tension panels can maintain both the beauty of light translucency and the functionality of insulation. I love the flexibility of the material and can imagine making some really organic shaped insulated structures.